The Pacific Northwest leads the nation in the percentage of families that chose cremation as their preferred method of disposition of the body upon death. The rate is currently around 77%. As of March 2019, only two methods of disposition are allowed in Washington State: burial and Cremation. But there is a very interesting third alternative that we have been watching for the last 10 years. Hydromation® is the registered trademark of a process called alkaline hydrolyses. During the mad cow epidemic in the early 1980, universities around the world frantically began studying ways to contain the extremely dangerous prions that cause the disease. 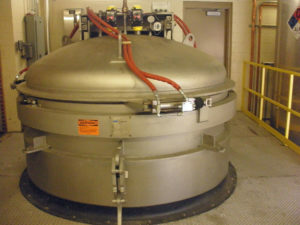 Alkaline hydrolysis was one of the methods found to be extremely efficient and safe. In 2011 we traveled to Athens Georgia to see a large tissue digestor that uses the alkaline hydrolysis method of treating animal carcasses. We studied the systems needed to support the process including large cooling and storage tanks for the sterile liquid waste. The solid remains consist of the bones of the animal, also rendered totally free of dangerous pathogens. By the time 2013 arrived, we met a Swiss chemist who suggested ways to speed up the process of alkaline hydrolysis to help make it cleaner and more cost effective. He called his process Hydromation®, which is an easy word to substitute for Cremation. Instead of being cremated, a deceased person can be hydromated. We licensed the process from Gesellschaft zur Vermarktung Geistigen Eigentums GmbH (Ltd. Co.) and have been patiently waiting for the State of Washington to approve Hydromation® as an approved method of disposition. We believe that the cost of Hydromation will be competitive with regular cremation and the environmental impact will be less. In the meantime, we took a good look at the environmental impact of cremation. Surprisingly cremation has a very small impact on the environment compared to most other human activities, like driving cars and polluting the rivers and oceans. Read here, “The Truth about “Green” Cremation, Burial, and Hydromation®“ for more in depth information.